The Crisis Response Networks mission is “Inspiring Hope.” The organization offers those with need a 24/7/365 Crisis Line. 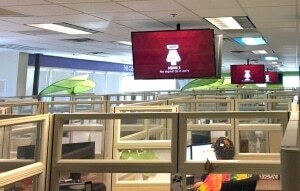 Arizona Audio Visual was asked to help with two projects. Ground zero of the crisis line is a large office space where professionals man the phones all day every day. We were asked to update their mission critical video display system which provides up do date information of critical needs and first responder status. The new system allows staff to react to critical needs situations. In addition, we were asked to update the organizations conference room with a new projector and audio system. We are proud to be a part of the great work that the Crisis Response Network is doing.